Sydney “Baby Boomer” Kevin Murray relates stories from his early years, and is struck by the number of them that seem to end with the painfully revealing phrase “and then my mum took me to hospital”. Click HERE to download the KINDLE (.mobi) version. CONTACT the author (Kevin Murray) if you wish to purchase a hardcopy version for just $19.95. At the age of 24, having spent most of my life in the protective embrace of home, school, University, then school again (as a teacher), I decided it was time to cast aside the security of familiarity and to experience the wider world. I decided, like many Australians before me, to wend my way overland towards Europe. I had little money and even less of a plan, but in March 1975 I boarded a plane for Bali... with my worldly belongings barely stretching the sides of my backpack, but with a stomach full of butterflies and a head full of expectation. Thus began a lifetime of travel. 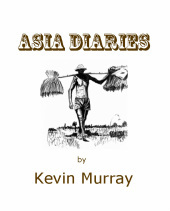 I twice returned to South East Asia in the 20 years after this 1975 trip. This book consists of extracts from my travel diaries in which I recorded each visit. They chronicle not only how this part of the World has changed, but also the changes in myself as the enthusiasm, wonderment and excitement of that first journey inevitably became a fading memory. This is a story of my family, or rather, of some members of my family. Not that they were famous - or even infamous. Nor were they immensely wealthy, in the ranks of high society, or politically powerful. They were just ordinary people leading ordinary lives, yet there is enough of interest in each of their life stories to warrant the recording of condensed accounts of their years on earth before these anecdotes are lost forever with the passing of the years.